Whether you need short-term or long-term storage, iCan Storage portable storage units provide flexible and convenient solutions – no matter what you are storing. Furniture, boxes, tools, building materials, and pretty much anything you can think of can be stored in an iCan portable storage unit. We wouldn’t recommend keeping Babe Ruth’s autographed baseball or your prized Van Gogh in an iCan, but then again, we do offer affordable storage tenant insurance plans to protect your belongings against theft or damage. When it comes to safety and security, our portable storage containers and secure storage facility are built to protect your stored contents against the elements and against theft. Heavy-duty steel construction with secure locking doors allows you and only you access to your belongings, because only you have the key. For helpful direction on how to properly and safely pack your storage container, visit the Packing Tips page. Video Surveillance: Keeps an eye over the entire facility and your stored items. 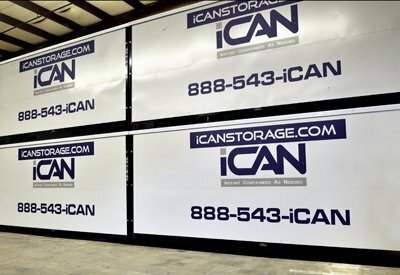 Once your iCan portable storage container is stored in our facility, you can access your items when you want to – just give us 24 hours notice so we can arrange for your visit. If you decide you want 24/7 access to your iCan, no problem – you can keep it at your home. Or give us a call and we can easily deliver it for the time you need it and pick it back up when you’re done. With this much flexibility, convenience and efficiency in all aspects of our portable storage systems, iCan portable storage units are ideal for all types of storage; residential, student, Realtor or contractor.